The martyred heroine of France fought and defeated the besieging English at Orleans, was captured and taken prisoner in Burgundy, and put on trial and burned at the stake -- all by the age of 19. Depicted as neither witch, saint nor madwoman in George Bernard Shaw's compelling story, Joan of Arc is but an illiterate farm girl whose focus on the individual rocks the church and state. Led by director Eric Tucker, four actors perform over 25 roles in Bedlam's riveting, stripped-down production of Saint Joan at the Folger Theatre in Washington, DC. "...The joyfulness of the performances and the humor the performers find in Shaw’s tart observations build a surprisingly lighthearted spirit into the evening, which may be why this “Saint Joan” doesn’t feel as if it’s a tiring sit. We are naturally curious, too, about this enigmatic central character, a woman insisting she belongs fighting beside men in a time when that was not only outrageous, but also an invitation to charges of heresy. Tucker’s band of players may be tiny, but they succeed unerringly in their quest to show us Joan as an unfathomable tower of strength." "...First the good news. For fans of George Bernard Shaw, seeing Saint Joan performed live in the intimate surrounds of the Folger Theatre is sure to be an exciting prospect. What better way to savor his contemplation of the rise and then shocking fall of the Maid of Orleans, or to consider his enduring comments on church versus state, nationalism, zealotry, gender roles and even sanity." "...If you go to see Bedlam's production of Saint Joan at the Folger Theatre, pray for patience and stamina. With a runtime of more than three hours, brevity is not the strength of George Bernard Shaw's play. That is not to say that the trials and tribulations of Joan of Arc are not worthy of a lengthy examination. Shaw went to great lengths to study the 'The Maid of Orleans' persecution. But the length of the play and informality of Bedlam's production leaves one feeling that the story was underserved." "...Brown is both powerful and delightful as Joan. She conveys in her posture and voice the knowledge that everything she does is for the sake of God's glory and the freedom of France, speaking straightforwardly, unlike the priests and politicians around her, enthusiastic and confident, incapable of considering that anyone could not see the rightness of her cause-for all that, human rather than divine." 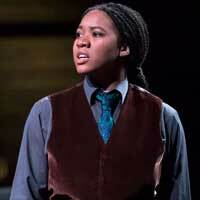 "...Bedlam’s Saint Joan is just a too cool intellectual secular production. In these current times, where God and faith and the secular are in a major war for America’s soul, Shaw’s Saint Joan from Bedlam left me cold for too much of its running time. That is until Joan became a person, not a saint on trial for her life. Then Dria Brown, with volcanic heat and soul spewing forth made the production totally hers. She took my breath away. I wanted to rise from my seat and help save her somehow. It was a positively incandescent theatrical moment." "...This production is important. Conversations of the role of the Christian church, nationalism, and economics have not changed much and seemed relevant. Also, a young woman who is as determined as Saint Joan is always going to be an inspiring story." "...For the most part, the New York company’s spartan approach in the Folger’s elegant, intimate space accentuates Shaw’s sharp language and discerning characterizations, and the players have some fun incorporating audience members sitting onstage into the nuances of a few scenes. Les Dickert’s shrewd lighting, in the last act, is doubly powerful, with a fading beam isolating Joan in her final helpless hour while allowing for the trio of other actors to rove about creating a restless assemblage of personages piping up from the near darkness of the audience floor and balconies. Tucker makes use of these spaces again in Shaw’s controversial epilogue."